COLUMBIA, S.C. -- Duke coach Mike Krzyzewski had the attention of his team with the season on the line, locked in a battle with a veteran UCF squad that brought the perfect combination of personnel and gameplan to knock off the tournament's No. 1 overall seed. He proceeded to deliver a message that resonated with his young group. "When the greatest coach of all time looks at you and tells you that you're made for this moment, it's like the most confidence you can be given," Zion Williamson said after the game. "So when I went to the basket, I knew it was going in." Williamson's bucket with a foul, followed by RJ Barrett's putback off the missed free throw with 11 seconds left, put Duke on top but it still had to play defense against a UCF team that had made dozens of contested shots throughout the night. The entire night had been a war, testing the resiliency of a young group that was on the verge of getting bounced by a more mature Knights team. After advancing the ball and calling timeout, UCF guard B.J. Taylor got a great look driving to the basket. Then Aubrey Dawkins got the rebound with an opportunity to mirror Barrett's go-ahead basket and best it with a game-winner. "My heart stopped," Javin DeLaurier said, describing the feeling of watching the ball above the rim in the final second. 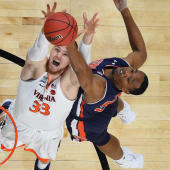 Williamson spoke of the basketball gods having Duke's back and the fact that neither Taylor's runner nor Dawkins's last-second attempt dropped put a cruel end to what had been, to that point, the exact kind of game where you see Duke fall in the NCAA Tournament. Seeing the ball hang on the rim was a sight all too familiar to Duke fans, one year after Grayson Allen's final attempt in the Elite Eight against Kansas hit every part of the rim without dropping. No one is going to give Duke the "team of destiny" label when it's led by the best player in the country, but nine times out of 10, this game ends with UCF pulling off the upset. The Knights had the experience edge with a rotation almost entirely filled by juniors and seniors. Dawkins had an otherworldly performance (32 points on 12 of 18 shooting with five 3-pointers), and coach Johnny Dawkins had the perfect defensive gameplan to cause problems for the Blue Devils. It started with Tacko Fall commanding the lane and defending the rim, preventing Williamson and Barrett from being able to get to the bucket where they have poured in so many points throughout the season. The Knights sat back in a zone defense and allowed Duke to get open looks at 3-point attempts, and the Blue Devils -- one of the worst 3-point shooting teams in the tournament -- only hit 5 of 14 3-point attempts in the second half. Those misses combined with UCF's electric performance on offense to create an environment that could have made this young team buckle. That was part of the plan, it seemed, to put the freshmen in a position where they would need experience they didn't have in order to hang together. "I was very impressed with the way that Duke, especially with freshmen, was able to withstand some of the shots we were making, and it says a lot about their will, and it says a lot about their overall mental toughness." Dawkins said. That mental toughness comes from Coach K and the rest of the staff, which has stressed energy and togetherness all season in hopes that it would hold them together for moments like Sunday night's game. Cam Reddish embraced the opportunity to address the criticism of Duke because of its youth, noting that "we grew up tonight." "We've been through so much together. Being together during those last couple minutes of the game, they hit some tough shots," Reddish said. "For us to stay together, obviously we're a young group of guys and people say a lot of stuff abut that. But we had trust the coaches and trust in each other. It's a good win for us." When UCF having a major experience edge, elite preparation and the personnel to limit Duke's strengths isn't enough, you have to wonder if there really is anything that the rest of the field can take away from the game. No team in college basketball has a rim protector like Fall, and few teams can expect the kind of individual performance UCF got from Dawkins. This was the game that Duke seemed destined to lose -- yet it survived. We should expect that Duke's opponents in Washington, D.C. will try to lift pieces of UCF's gameplan as they get their shot at bouncing the No. 1 seed. But replicating the effort, energy and execution of a senior-laden squad is going to be difficult for anyone not named UCF. If Duke does proceed to win the national championship, it's possible that the most challenging test in the path was here in Columbia against the Knights. Regardless of their final result, the Blue Devils are hungrier and even more championship-ready after having their maturity tested on Sunday night.